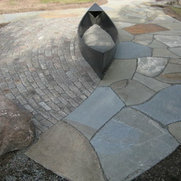 Blackstone created circular brick patio about 5+ years ago. We still love it! Hope to have them out again to do more work. Thank you! This is the second time we have hired Blackstone. It was for a small retaining wall along the front of our home on our side of a sidewalk installed by the city. We were in a time crunch and Blackstone accommodated us and had the job done w/in the time constraint given to them by the city so the city could finish the remaining grading and seeding on the project. As before, Blackstone's crew was very professional. The owners each stopped by the project both days the work was being done to be sure we were satisfied. They gave us referrals, also, so we could see other similar work they've done. Seeing a contractor's work first hand and talking to customer's they've worked for is far superior to looking at photos. It's a pleasure to do business with kind people that you can trust. They deserve 6 stars! 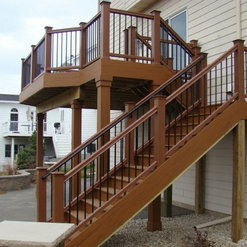 We hired Blackstone to remove a small Trex deck and replace it with a much larger redwood deck. Drew was very patient as I went through several changes of mind about what I wanted. He listened and came up with the perfect design. Rob, who did most of the building, is a true craftsman. He took care to ensure that each joist was perfectly level and he placed each piece of wood with such care. The result is more than a deck - it's a piece of art. We are extremely happy. We will definitely use them again and recommend them without any reservation. Great guys, beautiful work and total cleanup afterwards! Removal of old driveway & walkways and replace with pavers. Excellent experience with all aspects of the project. 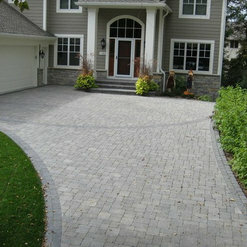 We highly recommend Blackstone Hardscape.